Hi beautiful! Happy Friday! Hope you’ve all had a great week ♥ So as you might know, I absolutely adore healthy looking fresh glowing skin. 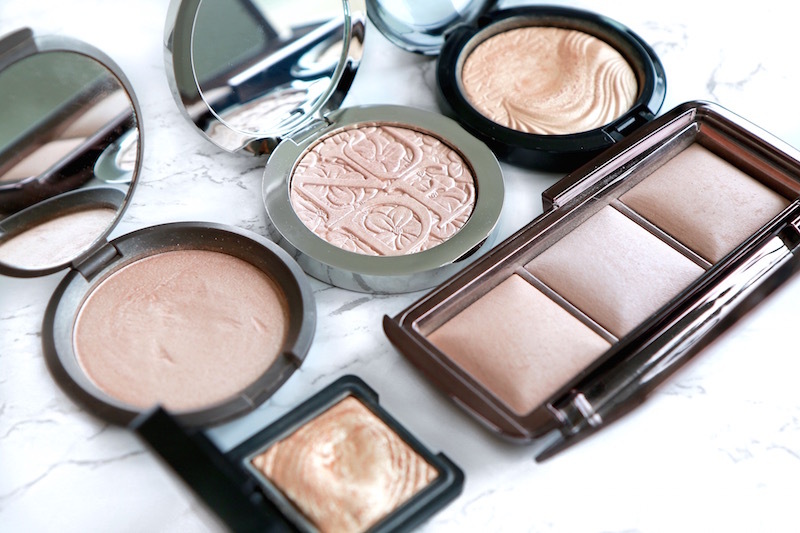 Of course taking care of yourself from the inside out will give you a glow naturally, but there’s just something so special about adding a touch of highlighter to the high points of the face. Every time I do my makeup, I look forward to this step! When that glow starts to build up, it's like hearing angels signing. So I’ve decided to round up my current favorites and share them with you. As my skin type is naturally more combination to oily, I like to wear a matte / semi matte foundation and then apply a highlight to the desired areas. This gives a really pretty, more “controlled” glow to the skin, as opposed to looking totally shiny all over (which a lot of luminous foundations tend to do - however they are great for more dry skin types!). I like applying highlight to my cheekbones, my temples, the inner corner of the eye, down the bridge of the nose, on top of the cupids bow, center of my eyelid, and sometimes the brow bone. I like using a light weight brush such as a fan brush (like this one) to avoid picking up and depositing too much product at once. It’s better to go light handed and build up gradually. Starting off with probably my most favorite, the KIKO Eyeshadow in 208 (here). As you can tell, this is technically not referred to as a "highlight" but it works beautifully as one, and the shade is so gorgeous! It has a warm golden undertone and looks beautiful on all skin tones. 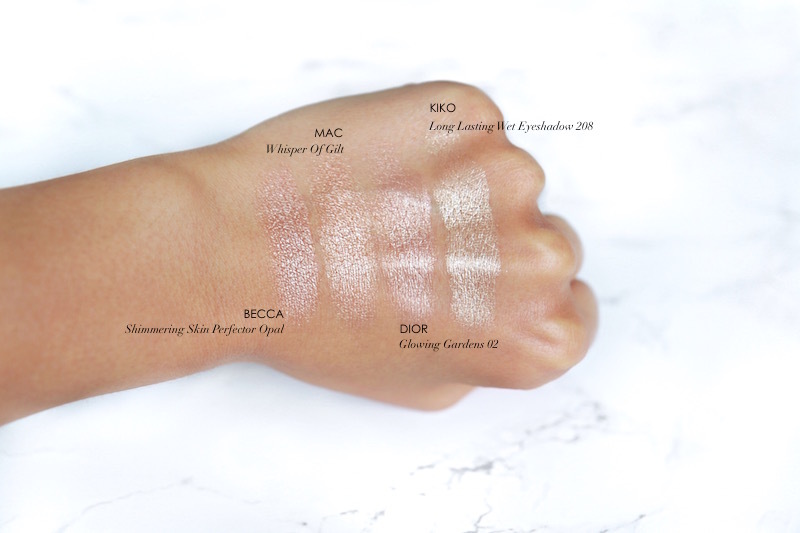 It is a well known dupe for many high end highlighters such as the Laura Geller "Gilded Honey", Estee Lauder's "Heat Wave" and MAC's "Oh Darling" and "Whisper of Gilt" - which were both limited edition. KIKO is a really affordable brand as well, I believe this is about $10, and the quality is really nice! Another one I love with a warm golden undertone is, as mentioned above, MAC's "Whisper of Gilt". I believe this came out in 2012 and was a limited edition piece. Before buying this one, I was obsessed with their "Soft & Gentle" highlight (which I believe is still available). That one had a more peachy bronze feel to it, so when the Whisper of Gilt came out, which is more golden, I fell in love. As mentioned though, it was limited edition but the KIKO one is definitely a dupe! Next is the Becca Shimmering Skin Perfector in Opal (here). This highlight is so buttery smooth. It is described as a "golden opal pearl" shade. It has a slight more peachy undertone in it which I think makes it beautiful for fair toned skin. With that said, I love the way it looks on my more medium tanned skin as well, so it is versatile. This is probably my most "opaque" highlight, a little goes a long way. Similar to the Becca one, but with a warmer golden undertone, is the new Dior Glowing Gardens Illuminating Powder in 02. This was part of their limited spring collection, so unfortunately won't be available for much longer. Everything about this product however is gorgeous! I love the silver quilted packaging, the floral pattern, and of course the actual product is beautiful. The formula is said to contain sweet orange extract, vitamins and minerals to help even out the tone of your skin as well. This highlight is super lightweight and has a fine milled shimmer in it. It goes on light but is definitely buildable. 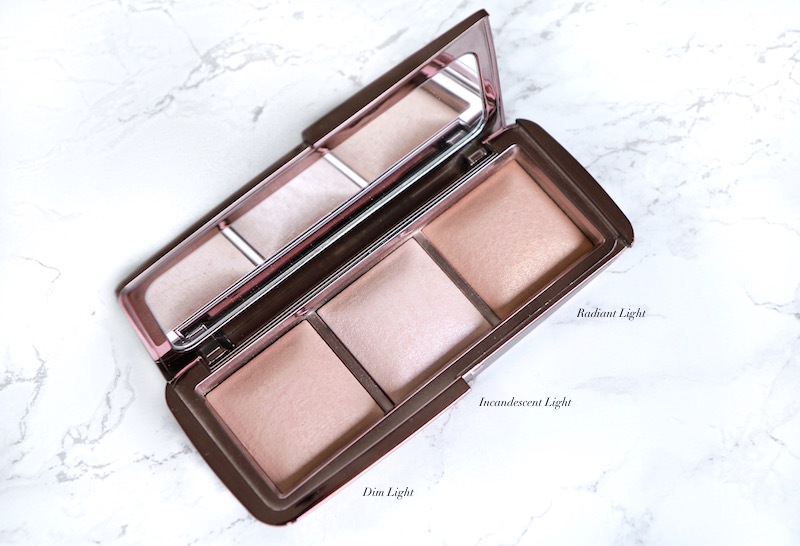 Last but not least is the Hourglass Ambient Lighting Palette (here). It honestly took me a few tries to get the hang of this product as it didn't really "pack a punch" as far as the regular highlighting abilities I was used to. This item had so many amazing reviews and Hourglass is known for making some incredible products (with notably high quality ingredients), so I kept trying it out in different ways and I finally figured it out and I'm obsessed! 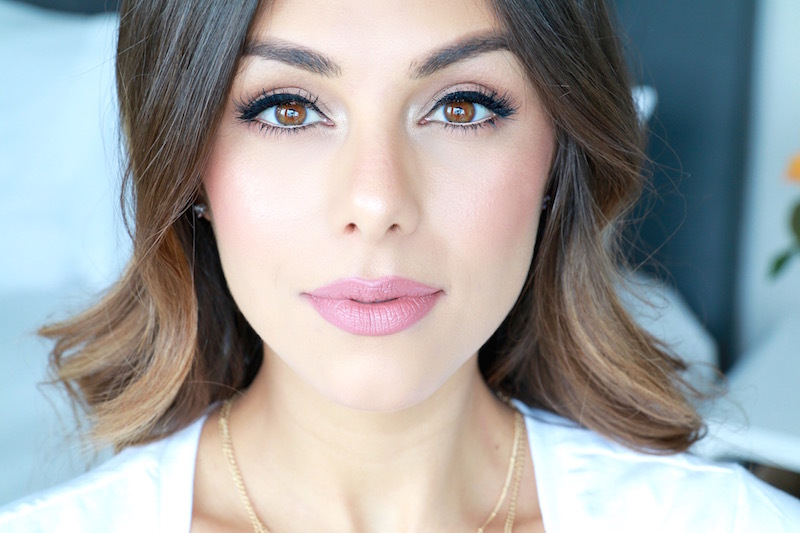 ♥ It's more of a luminous setting powder as opposed to a traditional highlight. It is described as a "high-tech, soft-focus finishing powder that recreates the most exquisitely flattering types of light". This product is unlike any I own, the quality is amazing, it is so finely milled and smooth, and gives you the most natural "lit from within" feeling to your skin. It is said to capture, diffuse and soften the way light reflects on your skin, instead of simply covering the skin. The result is beautiful! I like applying the first shade (Dim Light) in the center of the face and under my eyes, the second shade (Incandescent Light) as an overall highlight (also pretty mixed in with the first underneath the eyes) and the third (Radiant Light) across my cheeks to slightly bronze and contour, it ads a soft warm glow. You could also mix all three shades. 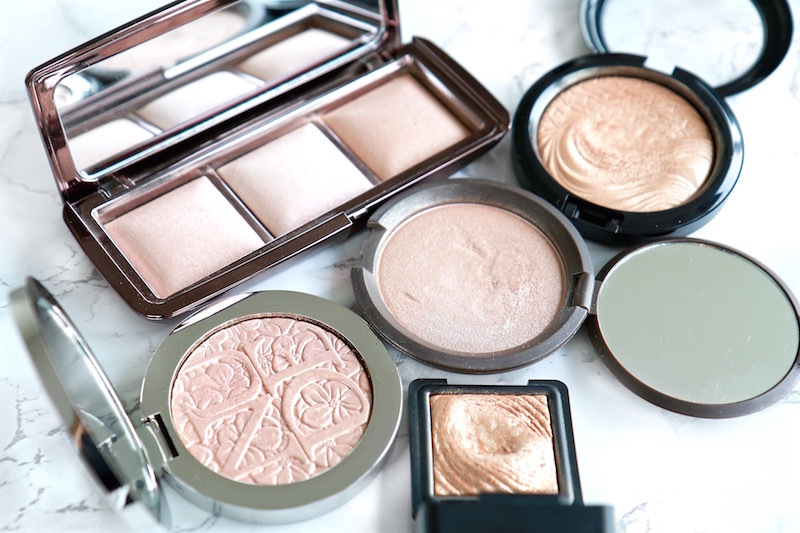 Setting your face when you're done applying the highlighter (and other makeup) allows the product to sort of "melt" into your skin and give it a really pretty naturally look. Some of my favorite settings sprays right now are the Caudalie Beauty Elixir (here) or Urban Decay All Nighter (here). I'm just wondering what widget you used to get tabs on your blog? annie what lipstick are you wearing here ? I love the Kiko highlighter its such a gorgeous colour! Which lipstick is it that you're using please? 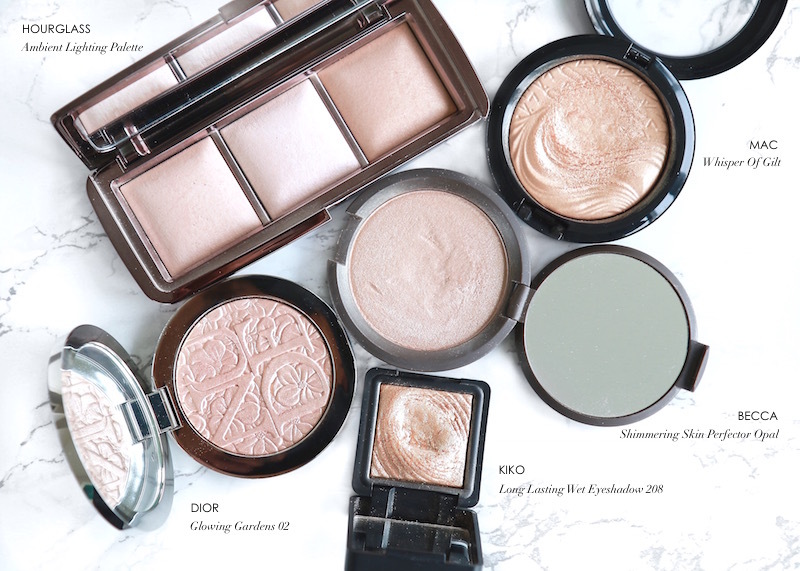 I've been looking for the perfect highlighter, the hourglass one looks gorgeous! Dying to try that Hourglass one! They all look so beautiful! These all look so amazing! I really want to try Hourglass products!